Viteslav Jaros was a surprise inclusion as Liverpool continued their preparations for Saturday’s Premier League clash at home to Crystal Palace. The Czech goalkeeper was handed an opportunity to train with the club’s senior figures on the back of Caoimhin Kelleher featuring for the U23s in Monday night’s 1-1 draw with Brighton. It continued a recent trend of Jurgen Klopp integrating the club’s brightest youngsters with his league leaders, with 18-year-old left-back Adam Lewis and versatile 16-year-old defender Ki-Jana Hoever having been involved in the last couple of months. Curtis Jones and Rafael Camacho have meanwhile been prominent figures in first-team training this season alongside their duties for Neil Critchley’s second-string Reds. Jaros can expect to feature at Melwood more regularly over the second half of the season following Kamil Grabara’s loan move to Danish side AGF Aarhus. The 17-year-old signed for Liverpool from Slavia Prague in August 2017 before making 10 league appearances and featuring in one FA Youth Cup clash for Steven Gerrard’s U18s. He has already managed nine league outings in comparison this campaign, as well as featuring once in the FA Youth Cup and on six occasions for the U19s in the UEFA Youth League. 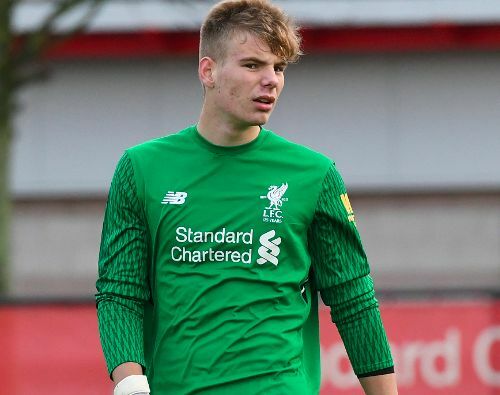 A string of standout performances on route to Liverpool winning the recent Mercedes-Benz Junior Cup also saw him named Goalkeeper of the Tournament.